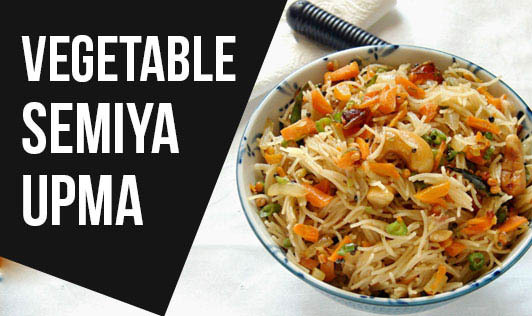 Made from vermicelli and fresh vegetables, semiya upma is a quick, easy-to-make, wholesome and filling breakfast option. Dry roast the vermicelli in a nonstick pan till it turns golden in color. Keep the flame on medium and make sure to roast it evenly. Once done, transfer to a bowl and keep aside. Heat oil and the splutter the mustard seeds. Now add the urad dal, ginger, chili, and a pinch of hing. Sauté for a minute. Add onions and sauté till it turns translucent. Add the vegetables and salt, and sauté for 5 more minutes. Now add a cup of water and boil for 2 minutes. Lastly, add the roasted vermicelli and mix quickly.